MODEL INFORMATION: GBT > 367 - 7"
Greville Bray has been an arborist for 20 years and always wanted to build his own chipper. In 2006 he showed the 367 at the APF show for the first time and January 2007 went to production. The GBT 367, the first model in the range, represents the fulfilment of that ambition. It is a 7 inch model which will be followed by a 12 inch version. The 367 is powered by a 36hp Yanmar diesel engine which comes with a two year warranty. 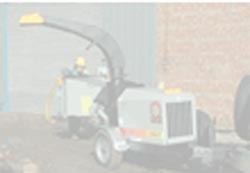 The chipper itself has a 12 months parts and labour warranty. It features a super single feed roller driven by a high torque, low speed hydraulic motor.